With snow or without, Hunter Mountain in the Catskills has zipline adventure tours that enable families to zip through and above the trees at thrilling speeds. If you’ve ever dreamed of soaring through or even above the trees, taking in scenery from a birds-eye view with the wind whipping past you, then you’ve got to try “zipping.” Zipline tours are currently the fastest growing form of ecotourism in the world, and for those who live near the New York metropolitan area, the longest (over 5 miles) and highest (nearly 600 foot) zipline tour in North America is right in your backyard. This is the most exciting staycation we can imagine. Hunter Mountain, best known for its skiing during the winter months, is located in the Catskill Mountains, just over two hours north of New York City, and it has partnered with New York Zipline Adventure Tours to open three different attractions that will make Hunter Mountain one of the premiere zipline spots in the country. These three adventure experiences will offer various degrees of thrills, from family-friendly canopy tours to breathtaking summit zips. Imagine a jungle gym — but not just your run of the mill jungle gym — a jungle gym complete with tight ropes, nets, and other obstacles. Now imagine that jungle gym raised 60 feet high in the air, and you’ve got the general idea of the Adventure Tower. A stand-alone attraction near the lodge at the base of Hunter Mountain, the tower is essentially a 35 foot square with nine features that gradually twist their way to the top, more than 60 feet in the air. I was given the opportunity to try out the Adventure Tower and found it to be quite the adventure indeed. You are strapped tightly into a harness and helmet (the same safety equipment used for rides on ziplines) and then connected to a continuous belay system, so you are always harnessed to the cables that run alongside each obstacle. Of course, the knowledge that you are unable to fall seems to evaporate when you’re balancing on wires many feet in the air. The tower is definitely not for those who are afraid of heights, as it’s nearly impossible not to look down as you navigate the various obstacles which include balancing on a row of wooden 2 by 4s, navigating a maze of wires and wooden planks, and climbing through various nets, all suspended high above the ground. Once you reach the top, a guide will help lower you back down to solid ground. 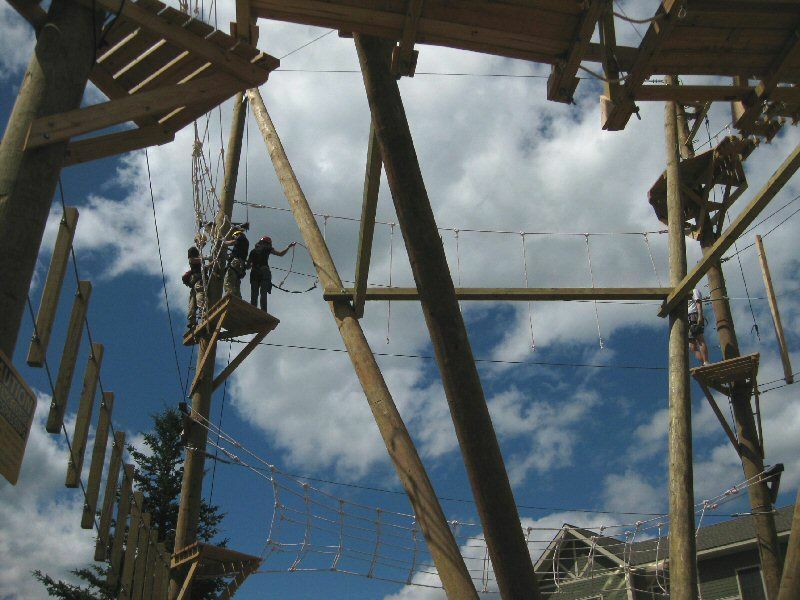 The fee for the Adventure Tower includes two climbs, so you can go through once and then decide if you want to challenge yourself differently the next time; one option is to try and not use your hands. Once (with hands) was enough for me though! Those who have a good sense of balance and don’t mind heights will definitely enjoy the challenges of the Adventure Tower, which is currently open year-round. There is no age restriction for the tower, but you must be over 4’2″ to climb. A canopy tour, in zipline terms, refers to ziplines that travel through the canopy of the trees rather than above them. 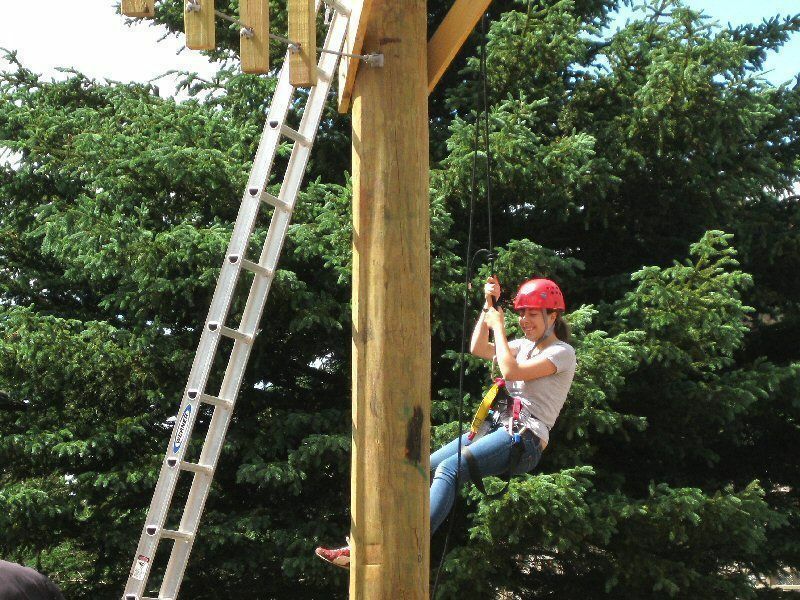 The canopy tour at Hunter Mountain is known as the Mid-Mountain Tour, and consists of six ziplines, four rope bridges, swinging bridges, 9 aerial tree platforms and a rappel lowering station. I got to test out two of the ziplines, which were both around 50 feet off the ground and 250 feet-long, though the Mid-Mountain tour’s max height is 60 feet and its longest zipline is 650 feet. First, my group and I piled into one of the special vehicles New York Zipline Adventure Tours has built just for use at Hunter Mountain. Compiled from the parts of three different vehicles, the giant yellow truck roared up the steep side of the mountain until we reached the beginning of the tour, a few hundred yards up the base of the mountain. The canopy tour begins with a zipline that runs through the canopy of the forest, over a rushing stream. Never having been on a zipline before, at first I was a bit apprehensive, but once I was strapped tight into my harness and underwent a safety check by the guides, I was ready to zip! Flying through the forest with nothing under your feet is an exhilarating experience and definitely an adrenaline rush. After my first “flight,” I wasn’t afraid at all and couldn’t wait to try it again. The next zipline stretches from the end of the platform of the first, so that the tour is continuous, and was once again a huge rush. The landings at the end of the zips, which I had worried about, were actually very easy to reach with the help of the guides. They slow your speed with a wooden block as you approach the landing platform, and they stand ready to catch you just in case you miss grabbing the rope waiting for you to help pull yourself up the platform. It’s also easy to control your speed as you’re zipping — if you stick your legs and arms out, the wind drag will slow you substantially, whereas if you “pencil” your limbs together, you’ll go a good deal faster. I loved the zipping experience and would definitely go back in order to experience the whole Mid-Mountain Tour, which runs about 3 hours. For each tour, groups of 2 to 12 people are taken out by trained guides who all seemed extremely professional and responsible. I was harnessed at all times and never felt unsafe. The focus of the Mid-Mountain Tour is to provide a fun adventure that is suitable for all ages — this definitely seemed the most family-friendly of the three attractions. The tour’s first five ziplines are generally pretty “mellow zips,” leading up to the final zipline which reaches speeds of 25mph. The tour also aims to expose people to the beauty of the Catskills, as its ziplines stretch over some exquisite stretches of forest, streams, and waterfalls. In the future, plans for the tour include themed platforms with informative signs on subjects such as the history of the Catskills, the region’s flora and fauna, and alternative energy sources. The Mid-Mountain Tour is currently open year-round. There is a weight restriction of 60-250 lbs. Participants must also be over 4’2″ and it is recommended for kidsa over 10 years of age. Participants should be in generally good physical condition, with no pre-existing neck, back, or knee injuries. Rather than a canopy tour, the Skyrider Zipline Tour means riders will zip above the trees, higher and faster than on the Mid-Mountain Tour. With five side-by-side ziplines, two people can zip at the same time and even race each other. The ziplines will criss-cross downwards from the summit, with the first zip at 3200-feet in length and about 600 feet in the air. While zipping, you’ll hit a maximum speed of around 50 mph. The Skyrider is North America’s longest, highest, and fastest zipline tour, and the second largest in the world. I had a chance to ride up to the summit and see where the first zipline leaves from and where it ends. Though this thrilling ride may not be for everyone, it looks like it will definitely delight adventure-seekers. The first zipline travels from one side of the mountain’s bowl to the other, hundreds of feet in the air, with stunning views of the Catskill scenery. The other ziplines zigzag across the mountain’s bowl from there. The Top of the Mountain Tour is run by trained guides, and the tour will lasts 3 hours and be open year round. The same weight and age restrictions apply as on the Mid-Mountain tour. New York Zipline Adventure Tours is owned and operated by Zipline Adventure Tours and was designed and built by Canopy Tours, Inc. The company, run by Bradd Morse, has been building and operating adventure tours across the globe for over 25 years. They have an impeccable safety record, and also run zipline tours in Montego Bay, Jamaica, and on Catalina Island, California. Since zipline tours are the fastest growing form of ecotourism around the globe, the company aims to increase tourism at Hunter Mountain during the summer months as well as enhance the winter experience at the ski resort with their ground-breaking zipline adventures. In addition to the ziplines and Adventure Tower, Hunter Mountain has a few other activities you can enjoy while waiting for the snow to fall. Normally, a skyride to Hunter’s summit is available during the summer months, but this year Hunter is replacing its quad lift with a six-person lift, and so only a mid-mountain ride is available. Nevertheless, the views are still lovely, and a new summit lift will be in operation by mid-August. Summer and fall festivals abound at Hunter, with the German Alps Festival where German food, drink, music, and activities will be available. Later in the season come the International Celtic Festival. Fall brings Colors in the Catskills and Oktoberfest. Any of these festivals can provide the perfect excuse to take a short vacation and try out the new zipline tours. Guided fly fishing and hiking are also available at the resort. If you feel like making your trip into a weekend getaway, Hunter Mountain has various lodging options. The Kaatskill Mountain Club boasts studio suites in one, two, or three bedroom combinations. Most suites are equipped with a full kitchen, terrace, and fireplace, and the hotel has an outdoor heated pool as well as two hot tubs. Though you may be content with a suite for your weekend stay, condos are also available at the resort through Pinnacle Condos or Liftside Village Condos. For more information on lodging options, visit Hunter Mountain or call 800/HUNTERMTN.